Birds will love relaxing in your yard in the Home Bazaar Chalet Bird House. This bright white home has a two story porch, complete with decorative railing. Four square windows adorn the unit, and a recessed door also has a square shape. The 1.125" diameter entrance hole rests at the top of the house, protected by the pine shingled roof. The removable back panel allows access to the home for nest checks and observation. The spacious interior has a small ladder glued below the door, aiding fledglings in leaving the home. Two drainage holes at the bottom of the house keep the nest dry, and horizontal slits below the roof offer ventilation. Mount this house on a post or tree with the included mounting peg, or place the home on a flat surface if desired. 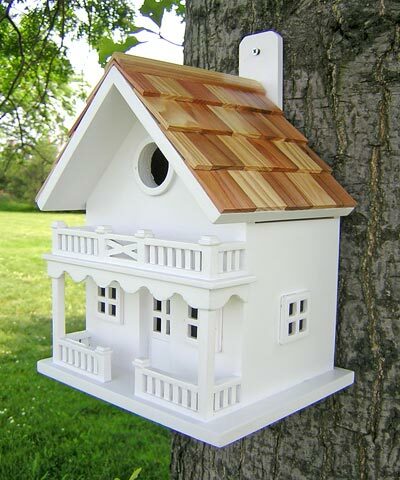 Invite birds to vacation in your garden in this Chalet Bird House.